GLUCOSAMINE PLUS | iiaa Ltd | The UK and Ireland distributor of Environ Skincare, jane iredale makeup and Advanced Nutrition Programme. As we get older we may not be as flexible as we used to be. Our body experiences wear and tear, even in younger people who do regular, vigorous exercise. 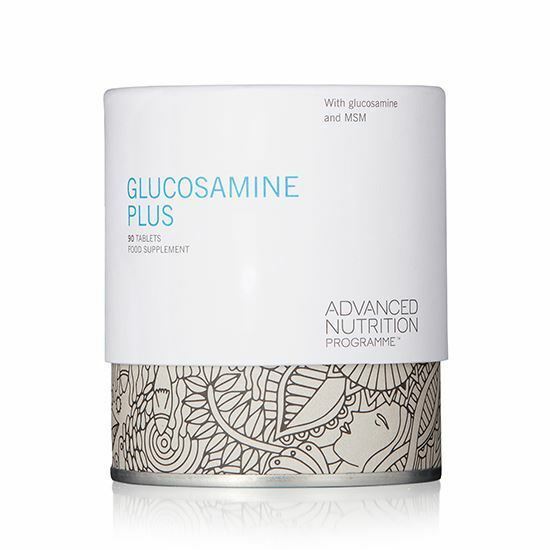 Glucosamine Plus contains MSM and has been designed to support flexibility. INGREDIENTS: Methyl sulphonyl methane, bulking agent: microcrystalline cellulose; natural Lithothamnion calcarea, glucosamine HCL (from corn), Vitamin C (ascorbic acid), anti-caking agent: magnesium stearate*; panax ginseng extract pdr, nettle leaf extract pdr, zinc citrate, anti-caking agent: silicon dioxide; coating: hydroxypropyl methylcellulose, glycerine; celery seed extract pdr, natural kelp†, ginger rhizome extract pdr, sodium borate, copper citrate. pdr = powder. *(vegetarian source) †May contain naturally occurring fish and crustacean. NO ADDED: sugar, soya, wheat, gluten containing ingredients, yeast, lactose, dairy products, artificial preservatives, colours or flavourings. DIRECTIONS: Take 1 – 4 tablets a day, with meals, building gradually, or as your health professional advises. Do not exceed recommended daily intake.